During our USA trip in the summer of 2009, I visited in the Coca-Cola Company in Atlanta, There I saw the artwork of Burton Morris for the first time: five paintings of cola bottles in pop-art style surrounded by light blue bubbles. So beautiful! Now I found a way to do this in school. And I think I'm the first blogger with a Morris lesson! Burton Morris (Pittsburgh, 1964) is an American pop-art artist. 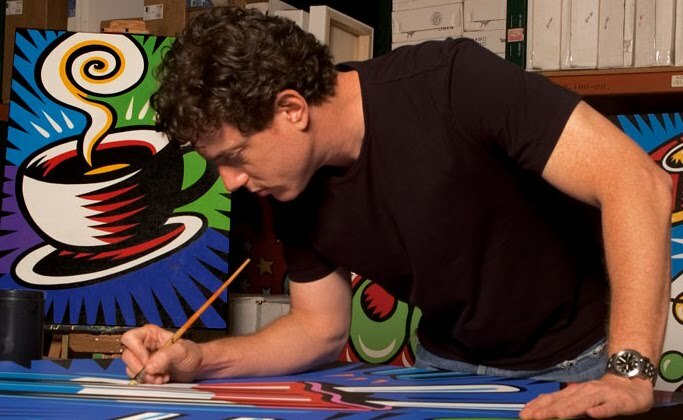 He is influenced by pop-art artists from the 60's and 70's, like Warhol, Lichtenstein and Haring. Now he is one of the most famous modern post pop-art artist. Morris's work shows a contemporary twist to traditional pop-art. His work is cheerful, energetic and colourful. His characteristic lines with the bright colours give his work a fantastic energy. Morris's work is known of tv-series like Friends and also appears in major advertising campaigns by U.S. companies like AT & T, Pepsi and Heinz. Show artwork of Morris on the digital board. Discuss the features: bright colours, black outlines, little detail, movement by little lines, white lines that suggest light and the distinctive black star shape around or in much of his work. 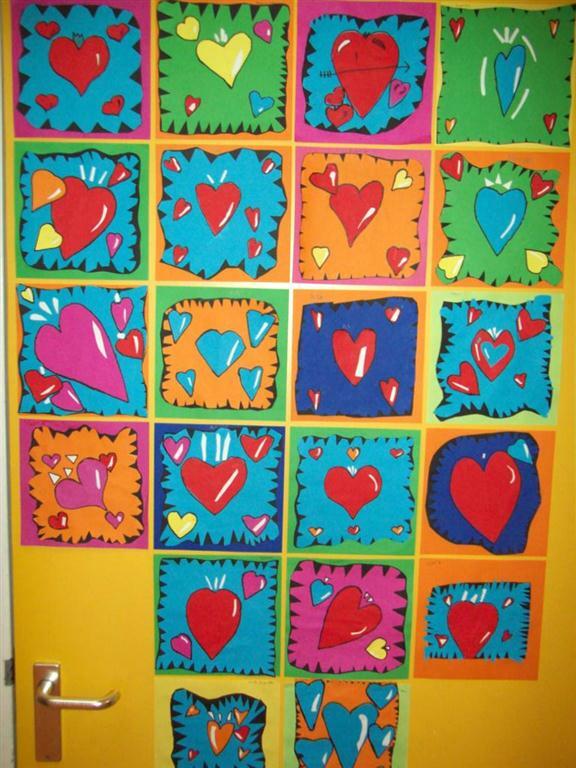 Students are going to make an artwork in the style of Burton Morris with the subject: Valentine's Day. Step 1. Take two colours cardboard: black for the edge and one colour for the background. take a construction paper for the big heart. Step 2. Cut the edges of the background cardboard sloping away, to make a sort of rug. You have to cut at least 1 cm around. Step 3. Cut a large heart from the second coloured cardboard. Cut white 'light lines' from a white sheet for on and around the big heart. Step 4. 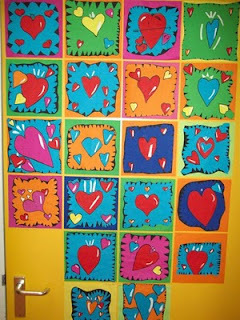 Cut some smaller hearts from several colours of construction paper. Cut white 'light lines' and paste them on the little hearts; all on the same side. Step 5. 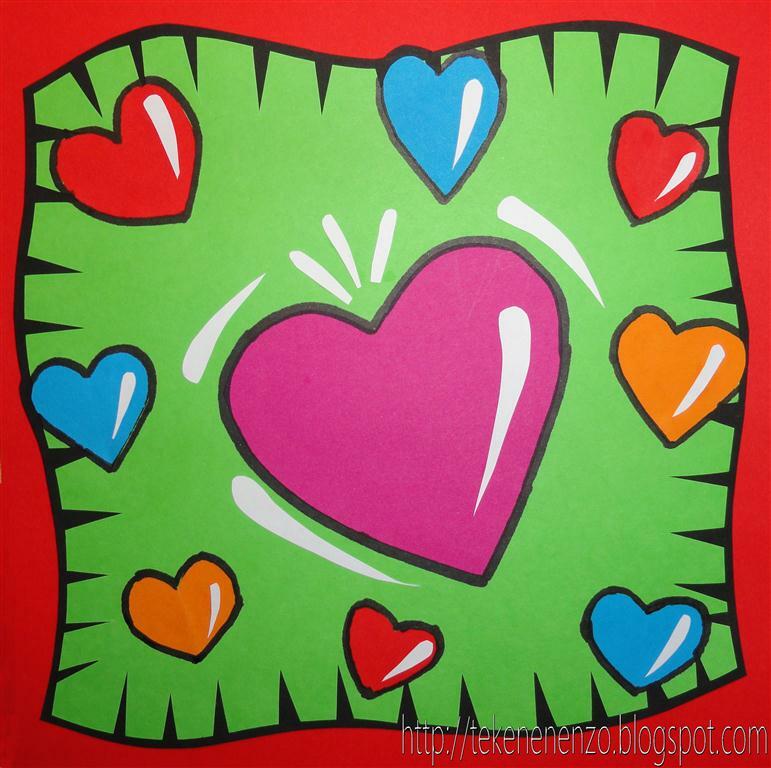 Paste the big heart on the coloured cardboard. Paste the light lines on the heart and around it. Step 6. Cut long triangles from the sides of the rug, the 'flashy stripes'. Paste the rug on the black cardboard. Step 7. Paste the small hearts around the big heart; you may k de kleine hartjes rondom het grote hart, where you can go over the triangles. Outline the small hearts with a black marker. Step 8. Cut the black background away, leaving about 2 mm on the edges. Step 9. Paste the work on a coloured sheet (A4 size) and cut it into a square. Thanks for introducing a new artist to my repertoire - great ideas! What a wonderful idea--I love it!! Thank you for sharing. I really love this! Awesome results! Thank you for the great lesson. I did it in 5th grade today and it was a huge hit! Thank you! My students loved this and we are the talk of the school!